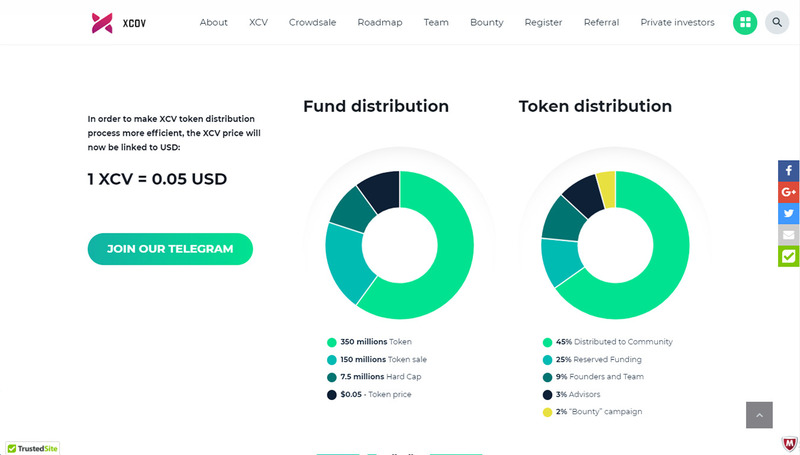 I think the project is interesting. Integrated support for Forex trading. There is trade using a trading robot. Can be considered for investment. Very nice . I think its for every one who missed BNB Binance . Its the best project now. It will be permanent alerts for traders and all news related to digital currencies also . you are bringing everything very fast. What is this rush for sale? . It is ridiculous that you are waiting for investments at this time when people are being defrauded. we recommend you to refer to us for more detailed and business partnership. 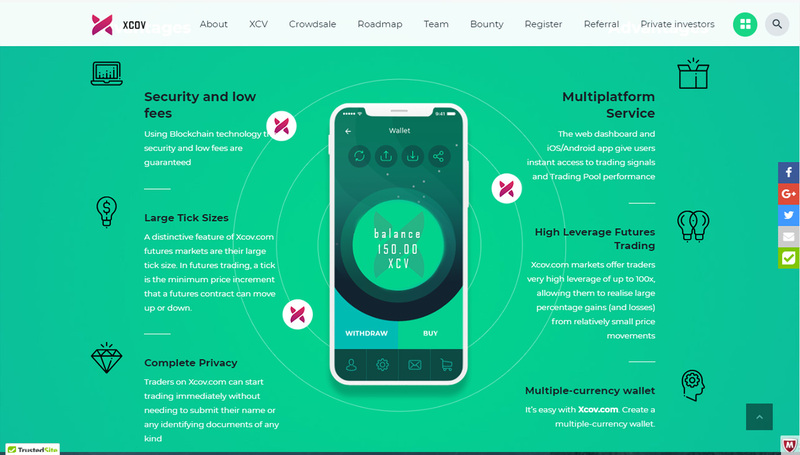 Ticker: XCV Token type: ERC20 Token Price: 1 XCV = 0.05 USD Total Tokens: 350,000,000 XCV Available for Token Sale: 45% Whitelist: NO Know Your Customer (KYC): NO Token Issue: Utility Accepts: ETH, BTC , LTC , BCH – Bounty: YES 2% of all tokens will be allocated to the Bounty Campaign. 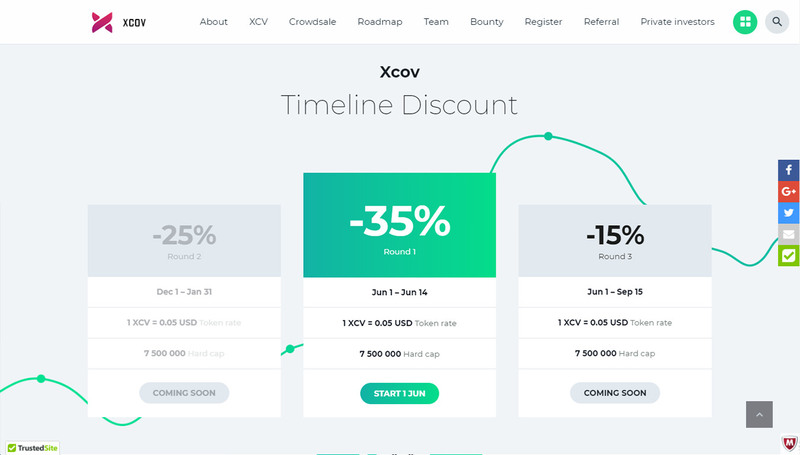 The bounties will be paid within 30 days after the end of the Token Sale. 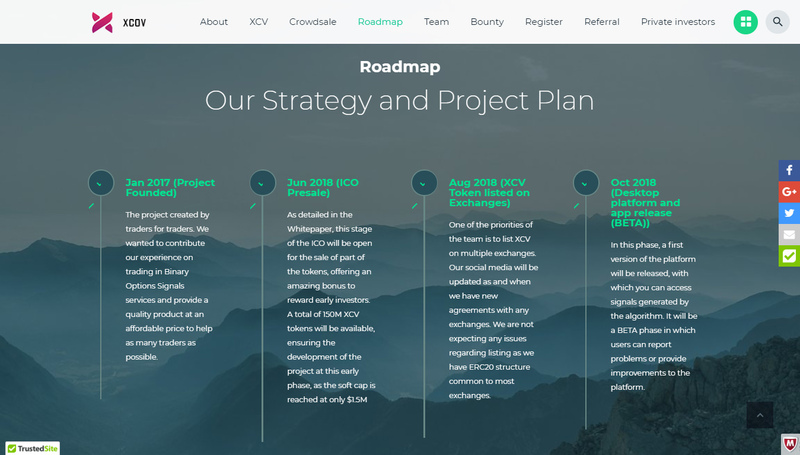 Please read: you can post any opinion about the project! 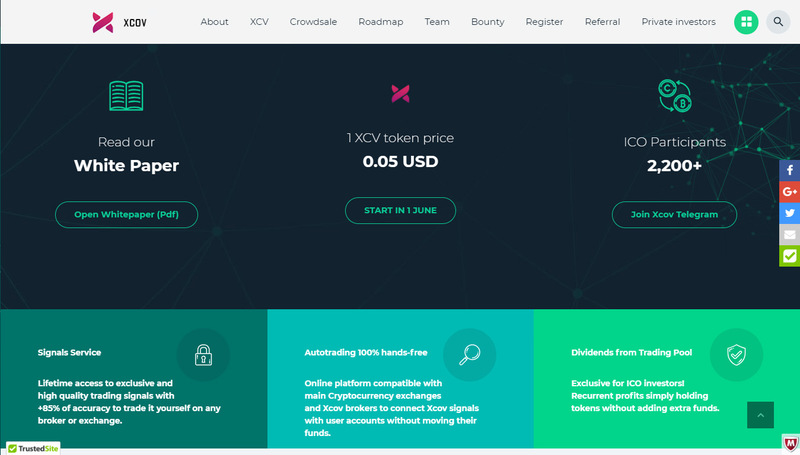 You will be able to get from 1 to 100 XCVs for an article, depending on the quality, distribution and uniqueness of your content. Minimum 3 Tweet/Retweet per week Maximum 1 Tweet/Retweet per day, and 7 per week All Tweets/Retweets must be liked. In case if our post contain the video, video should be watched. In other case your activity not counted. Minimum 3 repost/post per week Maximum 1 repost/post per day, and 7 per week All reposts/posts must be liked. .♥.. Bug Bounty Campaign ..♦..
Am I seeing right? If twitter has 10k followers you will give me 6 coin for every retweet. 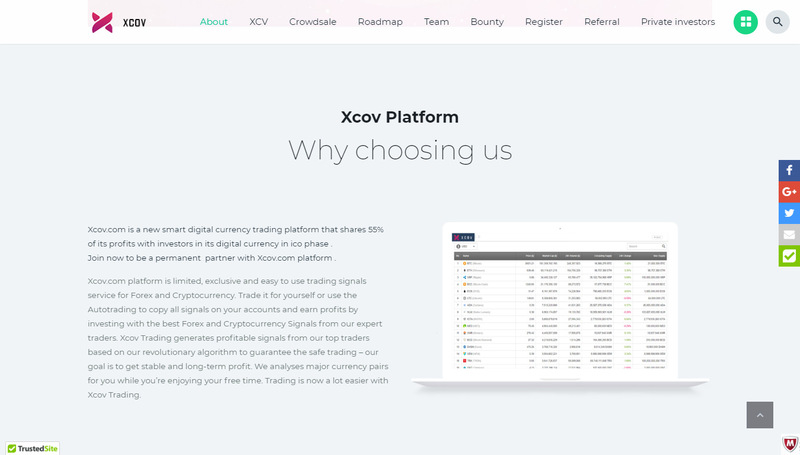 Xcov.com is a new smart digital currency trading platform lunched by experienced traders. 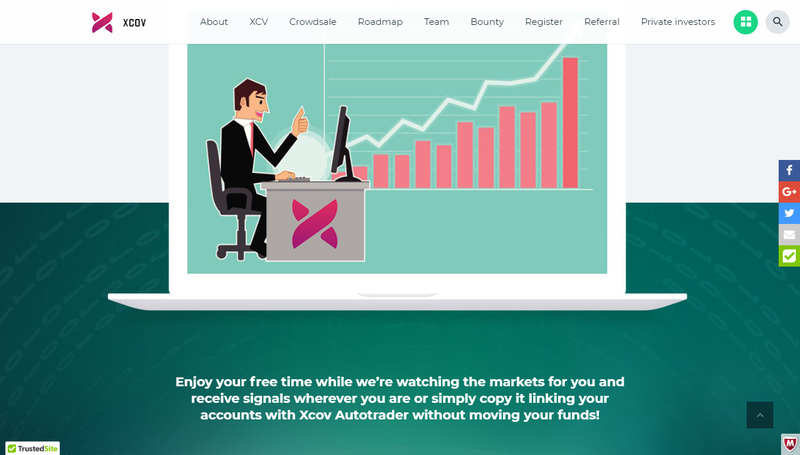 Our platform lunched by experts traders and investors for traders and investors . 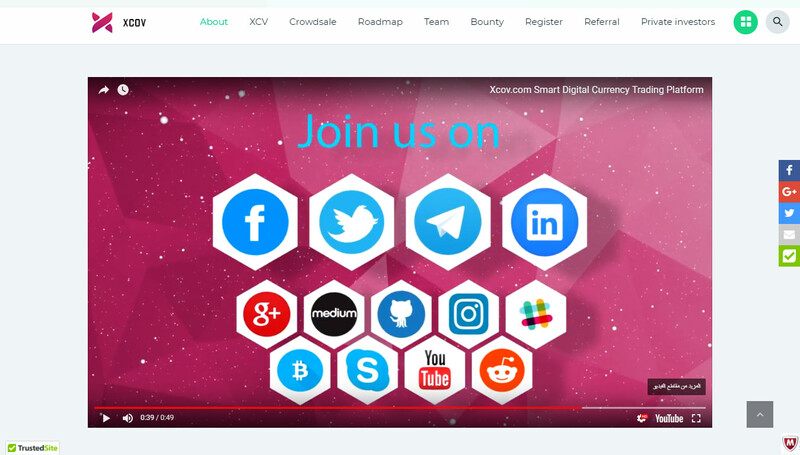 I have participated in this project, I advise everyone to join because I find this project has good team and good mentor will help the project achieve the goals that the project put forward. Good luck to all of you!